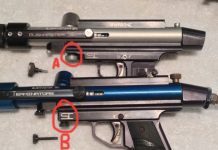 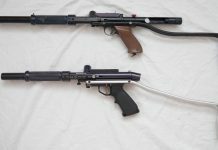 A look at two Wire Stocks on Line SI Bushmaster pump paintguns and some insight into the early Welded feedneck Skimrish / Line SI Bushmasters. 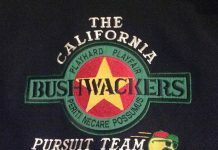 A diamond dust finish pre 1990 snub Line SI Bushmaster that I found a couple weeks back. 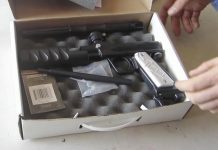 This bushmaster is in decent shape and has the SI pump arm screws. 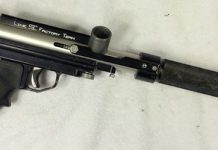 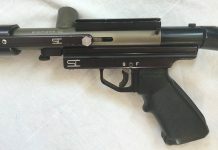 A Diamond Dust anodized Line SI Bushmaster from the early 1990s and why some factors lead me to think this was a replacement body on an earlier pump. 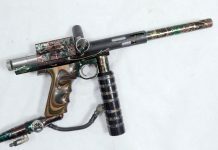 Woouulf and I look at and break down ICD's new PRP Pump paintball marker. 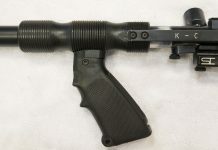 This is a new design that uses standard nelson or Line SI Bushmaster parts. 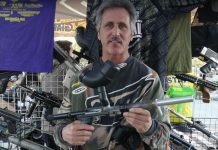 Rick Cendejas and Michael Baird talk about an old Line SI Bushmaster, which Rick fabricated a diagonal pump handle for and used around 1988 on the Ironmen. 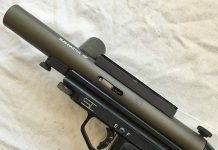 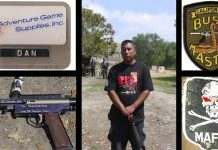 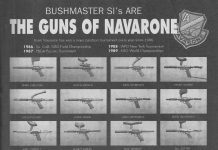 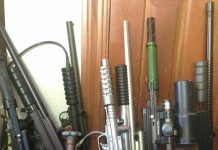 A closer look at the iconic Line SI Guns of Navarone advertisement and a few custom modifications on Line SI Bushmasters Pump paintball markers. 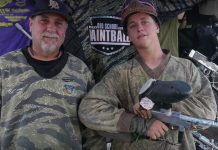 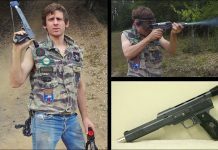 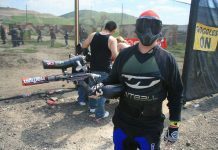 Rob Turner's Paintball History from 1991-1995, including his camo Airgun Designs Minimag, Splat 1, Napra MSPA and more. 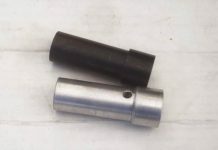 A comparison between the two styles of front grip frame screws on Line Si Bushmasters. 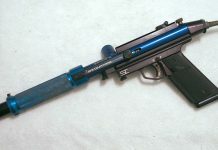 A Line SI Bushmaster engraved for the Florida Terminators. 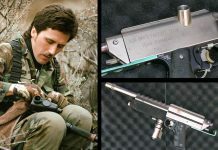 Some more information that Samuel Riley, from Unique Sporting Goods, sent me about his Line SI Navarone Bushmaster. 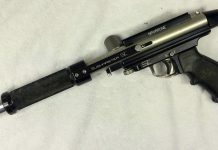 A Navarone Bushmaster I bought from Samuel "Riley" who worked at Unique Sporting Goods in Anaheim.